Are you ready to get out there and shop? Ready to face the crowds? Get an elbow in the ribs while reaching for a sweater? No? How about from the comfort of your couch in your pjs while sipping a cup of cocoa? Ah yes, that's more like it. I know a lot of you Americans are gearing up for your Thanksgiving Day sales, so I thought I'd make a list of some items you don't even need to leave the house to get for your book lovin' friends. That way no one gets hurt. These are all products I've spent my own money on over the years. 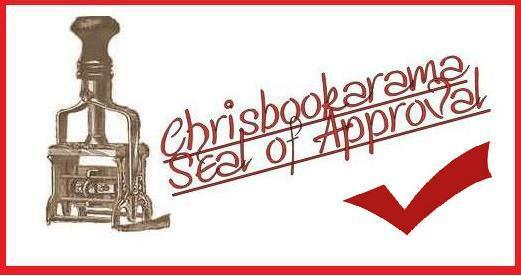 Since I've enjoyed them myself, they get the Chrisbookarama Seal of Approval. When I poke around Etsy for book related do-dads for my Friday, posts, I often go back and buy those things I found, so many of the following items can be bought from shops there. I was sad to see that some of my favorite shops are no longer selling on Etsy. One of the first things I bought from an Etsy shop was this Bookworms print from The Dreamy Giraffe. I love how whimsical her artwork is. She has something for a variety of hobbies and personalities. Along similar lines is Smiles Shop. More adorable artwork. Reading is Smart print is one I kept for myself. 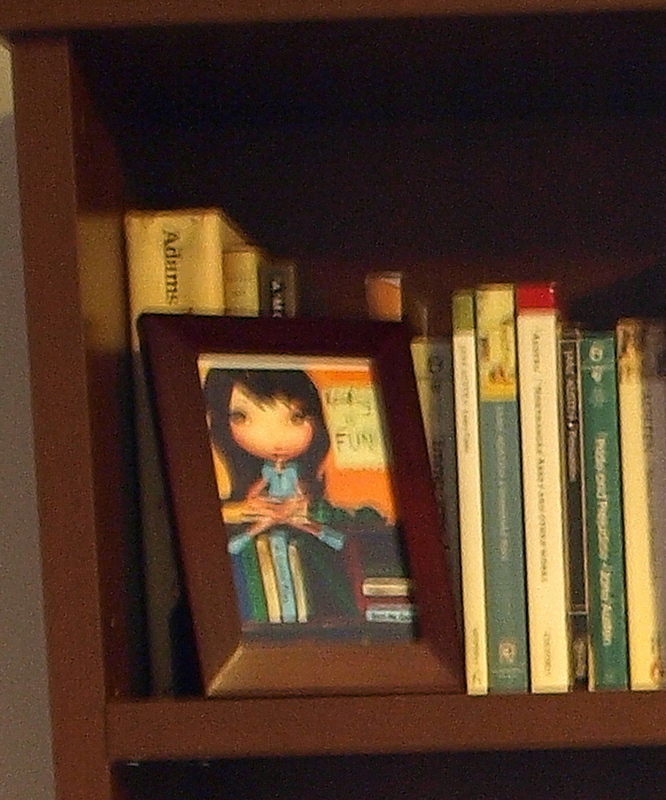 The Little Reader hangs on my daughter's wall. You can request a different hair colour for your little reader. When I first started blogging, poppets were everywhere. These whimsically odd creations can be found at Strange Studios by Lisa Snellings. Poppets have inspired authors like Neil Gaiman. Gorjuss in Scotland has beautiful bookmarks including I Found My Family in a Book. I loved the design so much I also bought the ipod skin from Skinizi. Antique Fashionista by Masha Laurence makes artful bookmarks inspired by the fashions of classic books, like the works of Charlotte Bronte and Jane Austen. She packs them in brown paper envelopes sealed with sealing wax! It's like getting a gift from Austen herself. Great for a bookish fashionista. Sybile makes Romantic bookmarks. Perfect for a romance addict. They're very durable bookmarks too. Book Darts are fabulous for marking specific passages without messing up your books. Perfect for the book blogger or book clubber who likes to quote passages. Buying books can be tricky but any lover of classics is sure to appreciate The Penguin Clothbound Classics. They are works of art. I absolutely love them. I was lucky enough to find two at my local bookstore: Emma and The Hound of the Baskervilles*. I would love more! These are real heirloom books. Book lovers might enjoy these gifts as well. They are not necessarily book related but fun! I like a little music when I read but nothing too distracting. The Pride and Prejudice Soundtrack is relaxing. I listen to it quite a lot. I can't walk into local shop Sweet Biscuit without buying at least a bar of soap. They have lovely scented items with clever names like Hot Little Number (smells like Red Hots) and Cranky Pickle (not pickley, more citrusy). I really love the solid perfumes (My Darling Vixen is my scent). They have gifts for men too. If you are a crocheter, my favorite go-to gift pattern is Reversible Strands Hat by Nancy Smith (scroll down on page). I've made five of these babies now. The pattern is fast once you catch on to it. Great for a guy or girl. I bought a few of these pocket mirrors from The Nebulous Kingdom. Anne-Julie Aubry creates dreamy, feminine artwork. You can admire her work before you admire yourself! *The Book Depository links are associated with my affiliate account. I get a small percentage of the sale. All other items listed are not linked to any affiliate program. My son loves book darts - they're the only bookmarks he uses. I listen to the Pride and Prejudice soundtrack a lot as well! And those Antique Fashionista bookmarks are amazing, I had never seen them before but now I want them very badly, heh. I love those Penguin clothbound books too! The Cranford I just finished is one of those. 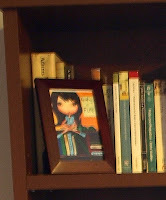 They have the bookmark ribbons in them as well. Lovely. Kathy- They hold a page very well. Iris- I love her art! Wow! Now I'm going to have to have some of those Pride & Prejudice bookmarks for myself and as gifts. They're gorgeous.